There's something strange happening in the universe that is making humanity's most cutting-edge physics experiments contradict one another. Scientists have produced the firmest evidence yet of so-called sterile neutrinos, mysterious particles that pass through matter without interacting with it at all. The first hints these elusive particles turned up decades ago. But after years of dedicated searches, scientists have been unable to find any other evidence for them, with many experiments contradicting those old results. These new results now leave scientists with two robust experiments that seem to demonstrate the existence of sterile neutrinos, even as other experiments continue to suggest sterile neutrinos don't exist at all. That means there's something strange happening in the universe that is making humanity's most cutting-edge physics experiments contradict one another. Back in the mid-1990s, the Liquid Scintillator Neutrino Detector (LSND), an experiment at Los Alamos National Laboratory in New Mexico, found evidence of a mysterious new particle: a "sterile neutrino" that passes through matter without interacting with it. But that result couldn't be replicated; other experiments simply couldn't find any trace of the hidden particle. So the result was set aside. Now, MiniBooNE — a follow-up experiment at Fermi National Accelerator Laboratory (Fermilab), located near Chicago — has picked up the hidden particle's scent again. A new paper posted to the preprint server arXiv offers compelling enough evidence of the missing neutrino that it makes physicists sit up and notice. If MiniBooNE's new results hold up, "That would be huge; that's beyond the Standard Model; that would require new particles ... and an all-new analytical framework," said Kate Scholberg, a particle physicist at Duke University who was not involved in the experiment. The Standard Model of physics has dominated scientists' understanding of the universe for more than half a century. It amounts to a list of particles that, together, go a long way toward explaining how matter and energy interact in the cosmos. Some of these particles, like quarks and electrons, are pretty easy to imagine: They're the building blocks of the atoms that make up everything we'll ever touch with our hands. Others, like the three known neutrinos, are more abstract: They're high-energy particles that stream through the universe, barely interacting with other matter. Billions of neutrinos from the sun pass through the tip of your finger every second, but they're overwhelmingly unlikely to have any impact on the particles of your body. Electron, muon and tau neutrinos — the three known "flavors" — do interact with matter, though, through both the weak force (one of the four fundamental forces of the universe) and gravity. (Their antimatter twins sometimes interact with matter as well.) That means specialized detectors can find them, streaming down from the sun as well as from certain human sources, such as nuclear reactions. But the LSND experiment, Scholberg told Live Science, provided the first firm evidence that what humans could detect might not be the full picture. As waves of neutrinos stream through space, they periodically "oscillate," jumping back and forth between one flavor and another, she explained. Both LSND and MiniBooNE involve firing beams of neutrinos at a detector hidden behind an insulator to block out all other radiation. (In LSND, the insulator was water; in MiniBooNE, it's a vat of oil.) And they carefully count how many neutrinos of each type strike the detector. Both experiments have now reported more neutrino detections than the Standard Model's description of neutrino oscillation can explain, the authors wrote in the paper. That suggests, they wrote, that the neutrinos are oscillating into hidden, heavier, "sterile" neutrinos that the detector can't directly detect before oscillating back into the detectable realm. The MiniBooNE result had a standard deviation measured at 4.8 sigma, just shy of the 5.0 threshold physicists look for. (A 5-sigma result has 1-in-3.5-million odds of being the result of random fluctuations in the data.) The researchers wrote that MiniBooNE and LSND combined represent a 6.1-sigma result (meaning more than one-in-500 million odds of being a fluke), though some researchers expressed a degree of skepticism about that claim. 6.1 sigma "combined" is a big statement which needs lots of detail. If LSND and MiniBooNE were the only neutrino experiments on Earth, Scholberg said, that would be the end of the matter. The Standard Model would be updated to include some sort of sterile neutrino. But there's a problem. Other major neutrino experiments, like the underground Oscillation Project with Emulsion-Tracking Apparatus experiment in Switzerland, haven't found the anomaly that both LSND and MiniBooNE have now seen. As recently as 2017, after the IceCube Neutrino Observatory in Antarctica failed to turn up evidence for sterile neutrinos, researchers made the case to Live Science that another reported signal of the particles — missing antineutrinos around nuclear reactors — had been a mistake, and was actually the result of bad calculations. Sterile neutrinos weren't a rejected idea, Scholberg said, but they weren't accepted science. The MiniBooNE result complicates the particle picture. "There are people who doubt the result," she said, "but there's no reason to think there's anything wrong [with the experiment itself]." 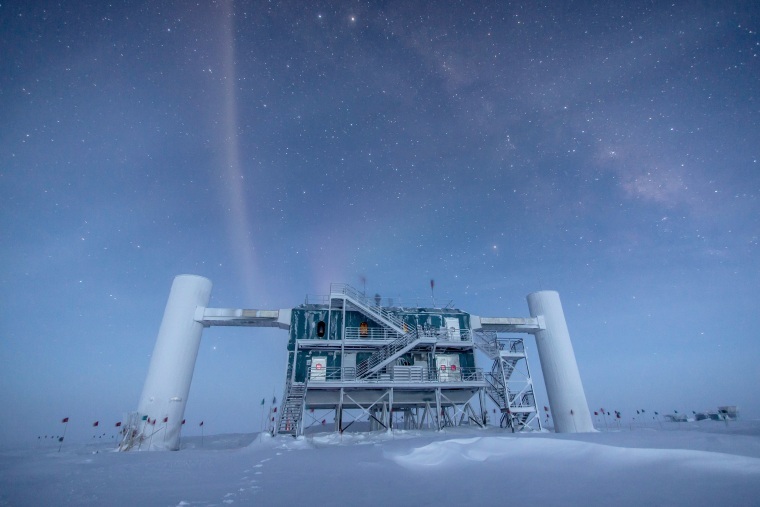 It's possible, she said, that the anomaly in the LSND and MiniBooNE experiments might turn out to be the "systematics," meaning there's something about the way neutrinos are interacting with the experimental setup that scientists don't yet understand. But it's also looking more and more possible that scientists are going to have to explain why so many other experiments aren't spotting very real sterile neutrinos that are turning up in Fermilab and Los Alamos Lab. And if that's the case, they'll have to revise their entire understanding of the universe in the process.